What Do You Call People with Multiple Interests? I’ve had an eclectic mix of interests for as long as I can remember. Two key ones – business and art – always surprise people because they see them as opposites. I find it amusing; I know my interests are paradoxical and span my left and right brain. I’m also interested in technology, innovation, interior design, photography to name a few. Similarly, I move through life in an eclectic way. I’m risk averse but I enjoy motorcycle rides, I like comfort and luxuries but I really enjoy travel where I “rough it” while figuring out the new place on my own, and as much as I plan for tomorrow, I love activities that are spontaneous and adventurous. I find that this mix of interests adds a lot more experiential opportunities in life. I can dive into a topic I find interesting and research it, follow my curiosities, change my thinking based on new information, and there’s always a new perspective to gain when I take on a new project. It makes me flexible, versatile, open to change and more well-rounded. Naturally, my fascination with this ability to have and pursue multiple interests led me to research it. There are many others out there who also describe themselves as being this way. But in order to find them, I realize you need to know the different terminologies used to describe such individuals. Renaissance man / woman. This one has a special place in my heart because my high school art teacher called me a “Renaissance woman.” I excelled in art along with all my other subjects. This term emerged during the The Renaissance which was a cultural movement that profoundly affected intellectual life. One key tenet of the Renaissance was that humans are limitless in their capacity for development, which led to the notion that people should embrace all knowledge and develop their capacities as fully as possible. The term “Renaissance man” was applied to the gifted people of that age who sought to develop their abilities in all areas of accomplishment: intellectual, artistic, social, and physical. Leonardo da Vinci has often been described as the archetype of the Renaissance man for his artistic and other contributions. One key tenet of the Renaissance was that humans are limitless in their capacity for development, which led to the notion that people should embrace all knowledge and develop their capacities as fully as possible. Multipotentialite. 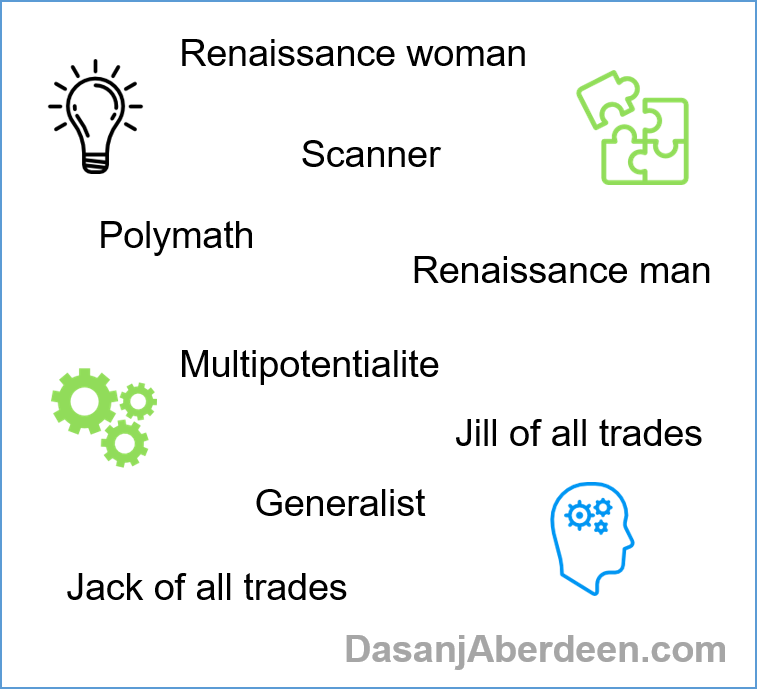 Multipotentiality is an educational and psychological term referring to the ability and preference of a person, particularly one of strong intellectual or artistic curiosity, to excel in two or more different fields. It also refers to an individual whose interests span multiple fields or areas, rather than being strong in just one. The term emerged in relevant research on giftedness. For example, in 1972, R.H. Frederickson et al. defined a multipotentialed person as someone who, “when provided with appropriate environments, can select and develop a number of competencies to a high level.” Most recently, Emilie Wapnick used the term “multipotentialite,” as a shared identity for her Puttylike community and in her book How to Be Everything. Polymathēs means “having learned much” and describes a person whose expertise spans a significant number of different subject areas and is known to draw on complex bodies of knowledge to solve problems. Are you someone with multiple interests and intellectual pursuits? How do you describe yourself and your interest in multiple areas? Do you use terms other than the ones above? Share them below! I’d love to hear your perspective!